A home is a personal space, one that very often reflects our style and character and this fantastic home that we are visiting today on homify 360 is no different. 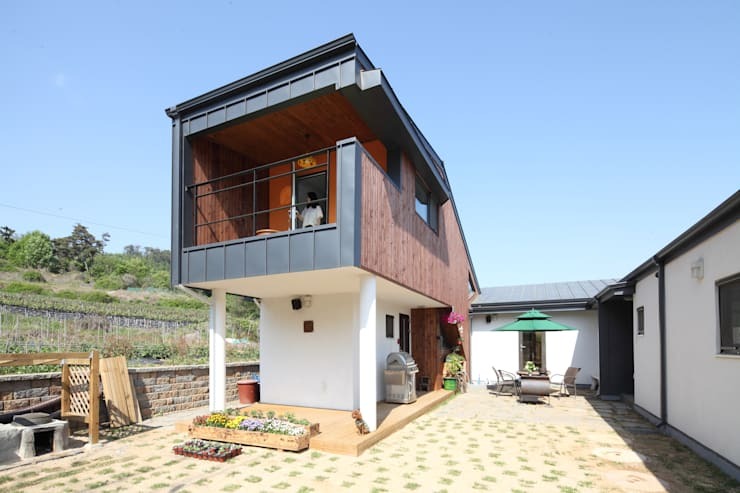 From the exterior, you can appreciate the stylish design that the team of architects at homestyletoto in South Korea have tapped into, creating a structure with an unconventional shape. A home with great open, social spaces, comfort and relaxation… now that is something we all want to experience! A house is more than just a place to live, it's a place to raise a family and grow old in too! Now who wouldn't want to enjoy a home such as this for the rest of their life? Let's take a closer look! Our first glimpse at this home is the open and welcoming terrace. This space has comfortable seating and enjoys the great outdoors. 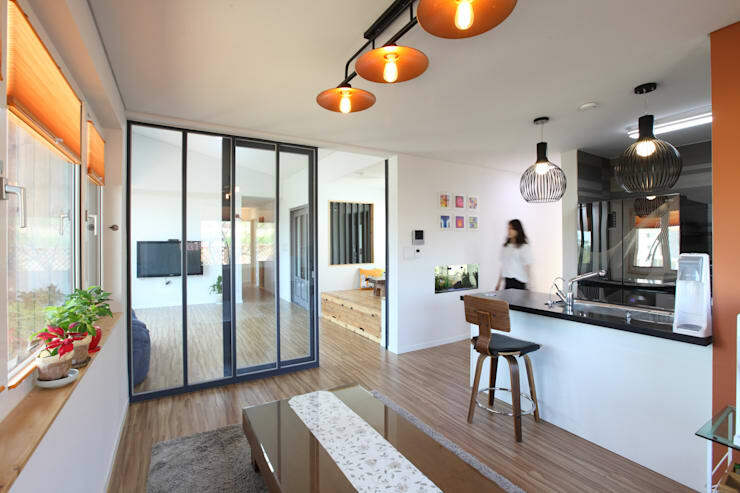 The glazed patio doors allow access to the kitchen and the home has been divided into social and intimate spaces. The home is situated in the middle of farmland, making it even more relaxing with fresh air and peace and quiet creating an escape from the noise of the city. The structure has a modern yet rustic look to it with its wooden façade blending so well into the landscape! The wooden façade covers the second floor of the home from the patio area and creates a rustic and elegant effect on this modern country home. 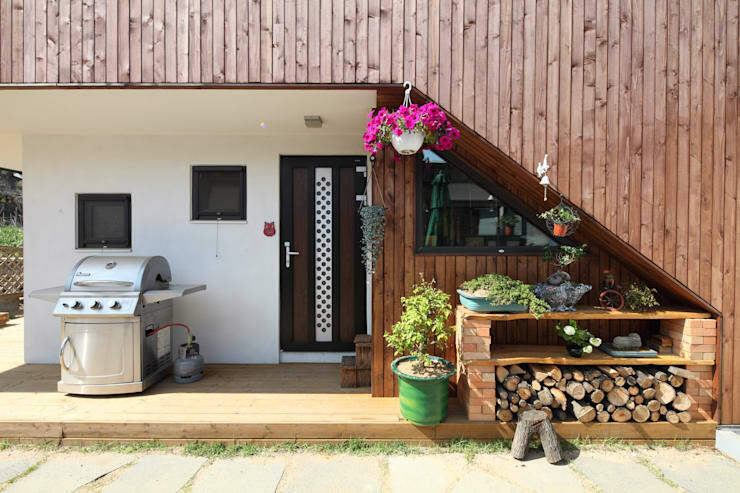 The outdoor space can easily be converted into a practical social area for those family occasions, while the barbecue can be enjoyed regardless of the weather! Here we catch can see a quaint garden area with some colourful plants and wood storing area. With so much outdoor space, planting your own herb garden would be easy! Now you never have to run out of your favourite delicious herbs for that gourmet meal! Here's how to: Have your own herb garden at home. The main entrance from the patio of this beautiful farm home takes us into the longitudinal single-storey wing of the house. Here we can appreciate the multitude of windows and doors allowing for natural sunlight and ventilation to be part of the home design! The living room is a great space to relax and unwind with a good book while enjoying the company of the exotic fish that are safely stored in the large yet decorative aquarium. Now that's the ultimate form of relaxation! Sit and stare at the fish or the great outdoors… it's your choice! This home is undoubtedly Asian with its clean lines and simple use of colour, along with the sliding glass doors and soft lighting. But the space that definitely adds the most Asian appeal to this designer home, must be the low eating area. But with a modern touch of a soft carpet instead of just sitting on the wooden floor. There is however a bar area too where you can enjoy a scrumptious meal if you are used to the European style instead. A picnic in your own home is now that easy to organise! If The warm feeling of a rustic kitchen is more your cup of tea, then enjoy the Ideabook and transform your kitchen! The stairway area is very unusual, but absolutely cool too! 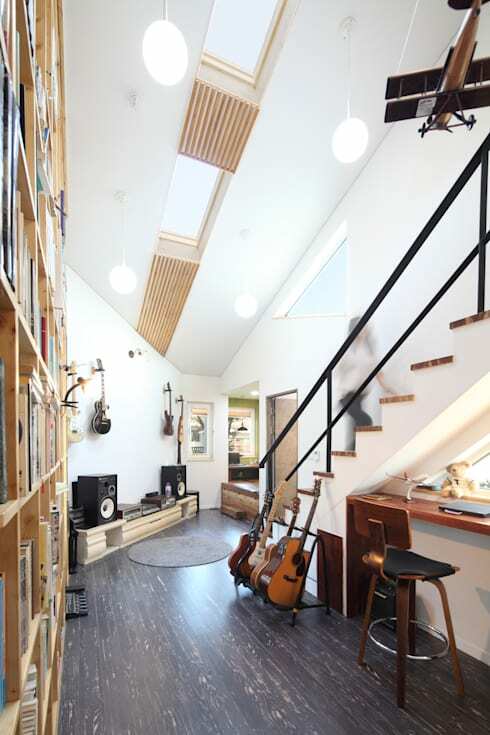 Aside from the fact that the stairs leads the way to the first floor of the home, the space beneath it seems to be just for enjoying music and with floor to ceiling shelves for that CD collection or books, this home owner is probably a rock fundi! How about that stereo and the guitars all over the place? Music must be the soul of this home! It's a music lounge, study and mini library depending on the mood of the occupants, but we adore it anyway! Just take it all in while you can! We end our homify 360 tour with a look at the blue bedroom located on the first floor of the farm home. We can already see that the interior extends outwards to the balcony, which allows for panoramic view of the countryside. 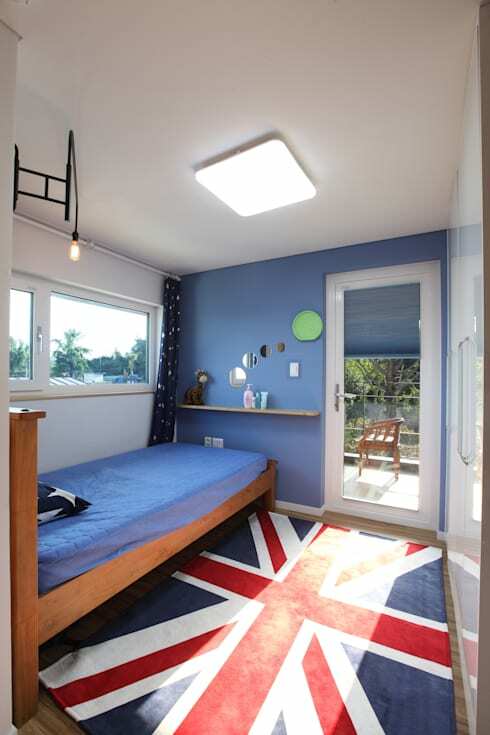 The bedroom has a minimalist and modern take, with the Flag of Great Britain included as rug, this matches perfectly with the blue walls, but is also emphasizes that this family loves to travel. Each aspect of this bedroom shows a personal style and character choice, which we love! Is this home design something you would choose? Do you have a favourite room?